My seventh stadium of 2011 was on Tuesday 8th February 2011 at Bloomfields in Needham Market, Suffolk. 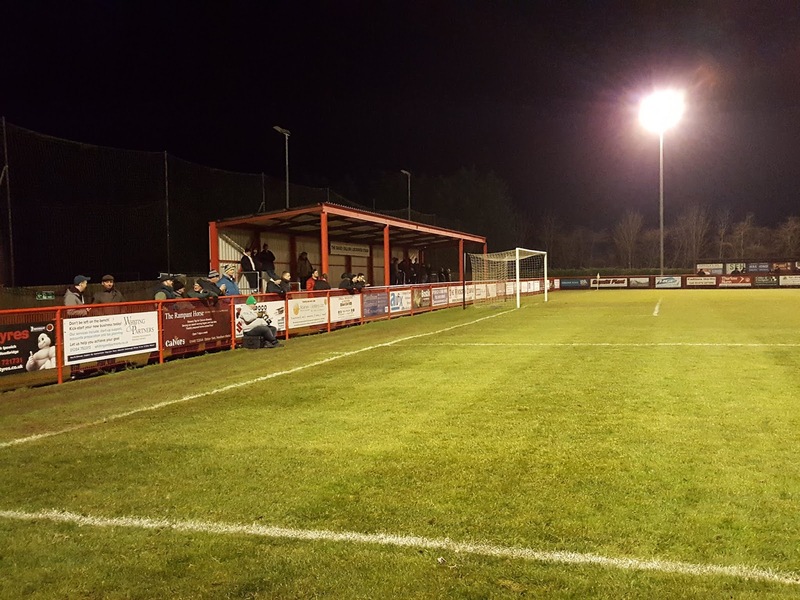 The match was Needham Market vs. Ware in the Ryman Isthmian League Division One North. Bloomfields is located around half a mile from Needham Market railway station with the ground nestled on the outskirts of the town in the midst of a residential area. It has been home to Needham Market since 1996. As it is only 15 years old the stadium looks comparatively new and is very neat with nice facilities for eighth-tier level. The clubhouse building in particular is rather impressive and the place has a feel of a well run community club with good local support. Surrounded by trees on most sides, the ground is very green and pleasant on the eye. On my visit the venue had only one seating area on the east side of the venue which can fit a couple of hundred people. However in 2014 the club added an extra 75 seat structure behind the northern goal. There are two covered standing areas taking up most of the western side of the ground. These two stands have a gap between then taken up by the two dugouts and a TV gantry. There is also a covered stand with 5 rows of concrete terracing directly behind the southern goal. The remainder of Bloomfields is uncovered standing. The game was of good quality with Needham playing some excellent football as they quickly raced into a 3-0 lead. Their fans were enthusiastic and created a good atmosphere as their club continued on in their attempt to gain a second successive promotion. 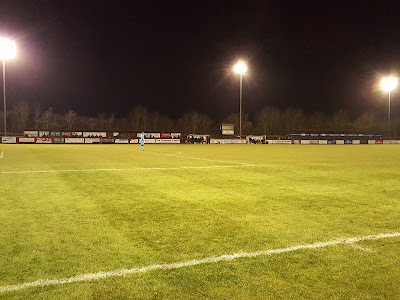 Towards the end of the game Needham took their eye off the ball somewhat allowing Ware two goals, generating a nervy finish, but Needham were able to hold on which was nice as it would've been somewhat unfair of them to have come out of the evening with less than three points.